Long-time TF blog reader, first time posting. Love the community and the new site! So I’m on board. I get the Keynesian experiment is coming to an end. I’m now trying to get my wife on board, but that’s the challenge. She is your typical wife/mother and is so engaged in day-to-day life that I haven’t been able to properly convey what will eventually happen. She isn't interested in economics/finance/markets and has a deep normalcy bias as do most people I try and broach this topic with. My suggestions to diversify our portfolio to include some PMs results in really really weird looks. Unfortunately, most of the resources on the internet related to this are either very sensational (to grab people’s attention) or so long and technical (and boring) that you almost need a finance degree to understand. I’m looking for something that she can see/read that isn’t over-the-top doom and gloom but does get the message across. Maybe an article or YouTube video that might be perfect for a 'newbie'. I'm thinking the best way is to ease her into the topic. Any suggestions would be appreciated! I definitely know what you're talking about, although she is getting more receptive. Fortunately, she's OK with me doing the preparations that I think are best, but isn't really buying in yet either. One suggestion is www.survivalblog.com, not the site itself, but you can choose from so many articles to pass on to her, hand picked by you and many by women, that are common sense preps, and that might help her understand what's going on. CHeck out the ChrisMartenson.com Crash Course. Its a video and covers finances, exponential debt, and issues related to resource depletion. On the site there is forum thread on the "reluctant spouse" well worth reading as is the personal story of Chris's wife Rebecca, and how to and how NOT to approach the reluctant spouse. I too would love any suggestions on how to educate the wife. Hell, my dog believes in me more on this subject than she does and he is much more receptive to SHTF scenarios. Im in the same boat as everyone else here. My fiance and I are young, she's 23 and im 26, she's never worked full time because she's always been school, so I think that's her main problem. She has the bubble mind set still, she still believes everything is the way it was in the mid 2000s and she will be like all the reality tv people she watches and will have the best of everything and a huge house etc. The first time I talked to her about this was in Novemer 2009, about 6 months after we began dating. She didn't even know there was a major financial crisis a year before. And when I told her I expected a total collapse of the US in the next 2-5 years she thought I was absolutely nuts and told me I was wrong. I then asked her to explain to me how I was wrong, she quickly changed the subject. So I quit trying to talk to her about it for a while and started prepping on my own. I think she has come around a little now with all that's in the mainstream media she watches. She brought it up a few weeks ago and I told her I stand by my prediction more than ever now. And we are now approaching the time period I gave her- - late 2011 to 2014 with the main target being 2012. Rawles' Survivalblog.com site is a great starting point. Very rational and reasonable without the 'tin hat' baggage. Print out his 'Precepts' page and have her read them. Search the site for wife/mother related articles. He has years of outstanding content to share. You might also take a look at https://paratusfamilia.blogspot.com/. Written by a wife and mother with a very practical and entertaining point of view of her role in living the self-sufficient life. If you're looking for a way to introduce physical security and firearms to her, Boston's Gun Bible has a marvelous chapter on women and guns. In my experience, the message needs to come from practical, credible sources. Not that you aren't both practical and credible, but the husband/wife dynamic can sometimes get in the way of the message. Once she sees that it is up to you both to protect and provide for your family and that she has a critical role to play, you'll have a partner you can count on when the Day arrives. Most people by nature are passive - don't bother me; I won't bother you - but if you anger them watch out! For instance, if you abruptly wake someone while they're sleeping you will most likely get a response of anger, panic, irritation, grumpiness, etc. If however, you stroke them gently to awareness you'll notice a different response altogether. They will be more pleasant, appreciative, understanding, etc. and willing to face-the-day (or move forward as in this situation). Same scenario as cutting someone off in traffic vs. using a signal; I'm sure you can predict the outcome. Learning how the (conscience and subconscious) mind works provides a complete understanding of why/how so many people follow dictators. ‘Pacing and leading’ - tell the conscious mind something true and actual, so that it (the conscience mind) drops it's guard which allows the subconscious mind to accept or believe whatever you want (the person) to believe. This method was created to help Psychiatrists heal their patience, but when in corrupt hands (as has occurred) it is wielded in ways unimaginable. Shockingly, this is only one of many methods – which can be used for good in this case as well. So, when trying to peak someone's curiosity when they’re having a hard time accepting what it is you are trying to convey - stroke their awareness, don't attack it. Always pay attention to how words and signals are used! If you need an example of why the majority of the people on this planet are unwilling to accept the truth or why they believe another false truth, just watch the 'talk' of truth leaders vs. false-truth leaders. My wife would simply sum this up by saying, “talk to me like I’m three” – be careful with that statement ladies and gentlemen, it’s only an analogy. We would never say anything that would truly scare a young child but it is understood that they are not on the ‘same page’ so we explain things in simple, non-condescending ways. I will provide one very good example: if your ‘better half’ approaches you with the question of “how does this dress look?” You reply, “it looks great”, but they return with another dress asking “how about this dress; how does it look?” The majority reply, “it looks great, but what was wrong with the other dress?” Although no harm was meant, she subconsciously second-guessed herself and you can fill in the rest from there. Quite simply, the reply should always be positive (ie. “You look incredible in both”). This backs her decision and leaves her feeling that she has your support. It is human nature, when feeling accepted and supported, to be more calm and open-minded. About to watch Inside Job with Mrs. Magis00 -- will advise. Over. Give her the International Forecaster. I explained the potential rise and the history of the metals. My sister now buys precious metals and shares and my mother too as well as my girl and her relatives. Now I don´t have to remind them they buy all the time. My wife and I watched the videos on You Tube and ultimately ordered the 3-disk set for the family to view. My wife has been on-board for quite some time but said she loves these videos because they filled-in the voids, and that Chris educates in a simple, non-threatening way without finger-pointing - her words, not mine. Just last week she came home from shopping and told me that she suggested these videos to a woman (worker) she got talking to while buying (medicinal) flowers for our backyard garden. She was excited that she could spark the conversation (which I generally do) and give advise that will help women become educated so they can properly prepare for their families. She told the lady that she was NOT alone in her financial struggles with her mortgage co. and that the videos will help her to better understand why the bank is doing what they're doing. She explained to the woman that the videos are FREE, easy to find on You Tube, and separated into chapters which makes watching them easy to work into a woman's busy schedule but warned that the videos sucked her in and she couldn't wait to watch the next chapter. My wife was grateful that I found the videos on You Tube and thanked me for inviting her in to watch them. Now you can't beat that fellas!!! treefrog land and cattle co.
My wife isn't totally on board with EVERYTHING I do.. but we do have a garden now and she is canning the veggies, making pickles etc.. when it came to the silver, I just sat down with her and showed her the numbers..
"401K.. My silver.. 401k.. my silver.. see that huge ramp up on the silver side and the mostly flat line on the 401k? yeah? ".. crazy eyes kind of sort of stopped there. Seriously .. even though I'm not "investing" for the sake of "making money" (I'm in it for the recovery after monetary dislocation), it was really a no brainer. Ok, I missed a few dips but the losses I incurred were WAY lower than any losses in my 401k, recovered quicker and were really smoothed out by the larger proportion of silver I bought at $12.00 oz. I'm still thousands of dollars ahead of the game though.. that's for sure. I just explained this all to her and it just put her in "Tolerate your crazy" mode instead of constantly shooting me looks of "LOOPY".. :) ymmv. The best thing you can do is _not_ find the perfect evidence of a problem or need to prepare. Instead, by doing prepping for little things, she may come more into the prepping mentality. For example, if your wife isn't into food storage: Set aside an area and look at items she uses and not items that you'd like to have stocked up on. Plan three months out and buy those items in advance. Place them on the shelf and then when you run low in the pantry or refrigerator, remind your wife that there is no need to go shopping and that you've already got it on the shelf "in the garage" or wherever. Women, in general, love the gossip and girly stuff. They love information overload when it comes to girly things and useless media and Hollywood factoids. They do not like to be educated on facts that contradict what their mainstream focuses upon. As Cognitive Dissonance was discussing earlier today, its really hard for people to live their whole lives growing up loving and trusting their father only to one day wake up to realize their father is Hannibal and he's a pretty hungry fella. Its a bit of an emotional trauma that many people fail to overcome. If you're into movies, its like the Matrix (no, not the crappy sequals!) where Neo has a really hard time understanding that the prison is in his own mind. If you're interested in this concept in more detail and the deception that perception has placed upon humanity, you may choose to study the "allegory of the cave" in detail. For a select few, this wake up process is a slap in the face that is much appreciated; most people will choose the "blue pill" of sorts and choose to lock the dream away in a corner of their mind. To block it out, they'll resist everything that you do to try to prepare or help them come to a realization again. This may mean for example, that instead of going out target shooting (if you like guns) they'll instead go on a shopping spree and buy more useless junk. Everyone has their own way to psychologically deny and resist that which they choose not to become fully conscious of. I've gone off on a tangent, but my point is that you don't need to force her into anything. Ask her to be accepting of your perspective in these matters and ask for compromise on decisions and conflicts. My wife thought I was nuts for spending a massive amount of each paycheck on silver, so much so that we had a number of "disagreements" about it. One day she realized that silver had gone up in value, so much so that in that day my silver investment made more than her paycheck. On that day, it clicked for her that there may be something wrong here and it was not that I was buying the metal. She actually called me up that day and told me that "silver went up today, what is going on with the markets? Why is it going up so much?" When she started asking questions, I try to help answer them as best I can. Same thing goes with coffee. My wife drinks coffee every day. She's noticed prices going up. I pointed out that the containers were also getting smaller. I asked, not said: "if prices are going up 20% and the amount in the package is 10% less, how much has the price really increased?" And the did the math! Thats the key, she actually had to answer the question and determine that yes inflation really does hurt. Since then, I've pointed out how we continue to see coffee prices go up. She used to hate the idea of me "hoarding" things like bullets and food. For the first time ever, she went to the supermarket and stocked up on more than enough coffee. She bought the brand/roast she liked and bought it in cheap #10 cans all sealed up to put on the shelf. On that day, I realized she's finally converted. This process with my wife took more than 2 years. The first year was me "telling" her the facts and problems of the world, it was nearly fruitless. The second year was a totally different approach and far more effective. Now let this post be archived in the anals of Turd as my first post on the new TF Metals Report site! Shock therapy is NOT the way to go. Start from anchor points that she already acknowledges/knows (e.g. rising price of gas/groceries/apparel). Am only at the point that she is OK with my PM stash -- but it's only 15% of our cash savings, and I need to get it to be a much higher ratio (no, it ain't that much in total either). Good luck to all, will try to come back and update if/when breakthrough happens. Thanks for all the ideas above. Edit: reading through Capt. Benny's account above -- I couldn't agree more. The realization/acceptance of the necessity of 'prepping' has to come from within a person. Cannot be forced, can at best be facilitated/gently nudged along. They love information overload when it comes to girly things and useless media and Hollywood factoids. They do not like to be educated on facts that contradict what their mainstream focuses upon. :-) Not all of us women are into gossip magazines! I can't stand them! Yuck! But yes, there are some generalities we can make. On the surface, women may seem to be more interested in "gossip." They are actually interested in "relationship." We women often relate based on "feeling" vs. "thinking." (This is not to say women don't think - but our thinking is often informed by our feelings.) There is a tendency towards right-brained, holistic thinking vs. analytical but more reductionist, numbers-based thinking. This can even be applied in business - for example, I am not into charts and figures so much when it comes to trying to assess something like, say, how to best serve a particular online community. The left-brain approach would be to gather the data and look at all the numbers. I might approach it more holistically by getting a "feel" for people through observation and interaction. In a right-brain approach, you might try to understand how someone thinks and feels vs. simply slap a label on them based on a demographic. The reductionist "label" might say: white male, age 35-50, owns PMs, buys guns, likes Ron Paul. Does that also inform the why? Why does that white male own PMs or like Ron Paul? The label and the numbers don't explain that. I might say: That man, who buys PMs and likes Ron Paul, is motivated by a deep-seated passion for the ideal of self-determination. He gets a sense of pride, accomplishment, and purpose by being able to take care of himself and his family. He wants to direct his own life, chart his own path. Freedom is important to him, because it is part of his identity as a noble fighter for truth in a world gone mad. How does this relate to how you might communicate better with your wives? Women relate more holistically, emotionally, and spiritually than men generally do. The numbers may not mean much to them. They need the "why" and they need it put into context. Women also tend to go more on gut feeling, instinct, and intuition more than men do. I got a little flack here once for being into "mystical" stuff, but my observation is, the women I know of, who do know that something is coming down the pike, know this because they are tapped into their intuition. On a deep-seated gut feeling, they know something is not "right" and they can sense something bad coming. One size does not fit all, and I cannot speak to your individual situation or how your own wife might react. But throwing numbers and stock charts at her may not really mean much to her. Sitting her down and asking her how she feels - on a gut-level - about the direction the country is going in - might be a better approach. Then ask her what she might want to do to protect her family and make her "nest" (her home) more secure. This is not to say that all women are feeling driven, or that they won't get something out of a link or a video. I'm just suggesting another tack if the numbers aren't getting through. All of the above advice is really good. You might also check out Jack Spirico (sp?) Survivalpodcast.com. This guy does a 1 hour podcast several times per week, which he has been doing for about three years or so. This is a great resource for all kinds of prepper info, but he has done three or four shows specifically concerning getting your "significant other" on board. Strictly on the subject of silver & PMs - Mike Maloney's book - guide to investing in Gold & Silver is a great book for the beginner, and should help any newbie to open their eyes. This was suggested on Turd's blog a few months back, and I read it based off of that. It is the best place to start easy and without shocking a newcomer. I agree in incrementalism. Everybodys household is in a different spot. I am 30 and my wife is 31, she is also from the Philippines so my situation is a little different (in world views). We don't have tons of money, but we both work and do ok. She was VERY receptive to the stacking PMs concept and is all in on that. She heard stories of grandparents after WW2 hoarding their silver pesos (minted in San Francisco) because after the war and independence they debased the currency and plunged the country into a depression. The USD to PHP was 2:1 back in those days, today its 43:1 so she gets the preserving wealth concept. Its also normal practice when they need extra money to take a loan at the pawn shop with their gold jewelry. Keeping food was an easy one too, once she started to see the inflation happening. Things like the Japan earthquake or tornados as a reason to store food and water. The point being anything can happen at any time, and being prepared is being empowered. I think women are more receptive when they can SEE you connect the dots. The main thing she learned is that when something happens, no one will help you, you must help yourself. That is both biblical and common sense. We watched "The American Dream" the other night, which opened her eyes a lot to the banking cartel (and she got a little American history too). If you havn't seen it, its on youtube, 30 mins long and animated. And from that explained why her country is so poor, because they are indebted to these bankers and have no ability to pay it back, and with it comes the corruption which is out of control there. The biggest obsticle I found was her friends. Do you have a 401K? What about retirement? on and on and on undoing all my work, but once she sees that cash is trash you are good :) All in all things are going pretty good in the understanding, and she also keeps very tight lipped about PMs. Well, despite my having to pause it 37 times to fill in information, we ended our viewing of the Oscar-winner with this money quote: "I'm disgusted by all of these guys. They need to die." That's a start! My last nudge was: "...and we and our children and grandchildren are paying for those 'hookers and blow', baby." I thought that was a strong close -- but that's where we head next. Yes, incredible corruption; yes, socialized losses/privatized gains ... but so what? PMs, that's what. 2 years might just be the time cycle required ... because we're right on that here. I've converted several females in my day. None of them were my wife, but nevertheless they were women. I've discovered, as I'm sure many of you have, "some people you just can't reach". On the other hand some you can. I certainly agree with CD that gradually is really the only way. You can plant seeds and some will sprout and then blossom, others will wither and die. I find that as illogical as women can be, their thinking in matters such as finance and politics can still be rather logical. I find the "Peter Schiff was right" videos to be very compelling. They offer solid past predictions on record that have all panned out. They show Peter schooling the MSM morons. They are entertaining and when properly taken in even the most irrational female will have to admit "ok, he was right". 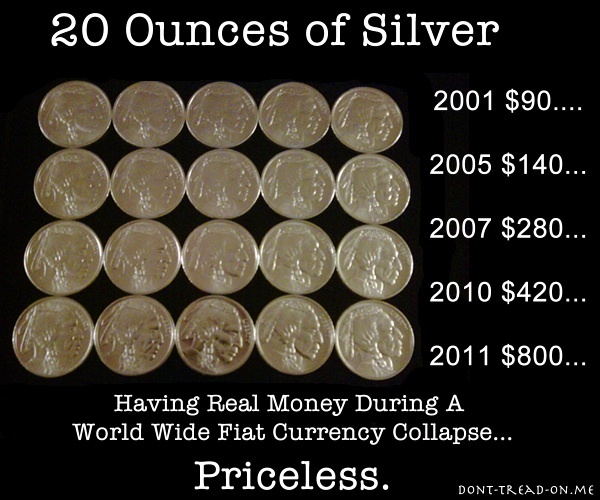 Once you have established that, you can then turn them on to some of his more recent predictions, especially those about gold and silver. I also find that films are very helpful... In my experience 2 in particular seem to really click with the ladies. The first is The Century of the Self. Almost every gal I've ever made watch this usually responds with something like "more please, I'm hooked"
The 2nd is Reflections and Warnings with Aaron Russo. I'm not sure if it's because he was Bette Midler's manager or if it's because he made Trading Places or what, but Aaron Russo seems to be able to cut through the female firewall. Anyhow, I'll be the first to admit I probably have a lot to learn in the "prepping the wife department" as I don't have one yet :) I have however convinced several of my female friends to protect their wealth with considerable PM investments. Some of them have even gone as far as purchasing a handgun. Guys, I took the wrong approach up front and went in with 'the sky is falling' LOL. That was last year. She really got sick of it, but she did let me take over managing the nest egg. Watching AG\AU rocket up certainly helped. Since then, however I think in her heart she want everything to go back to the way it was, with booming property, massive mortgages and just playing the job game(trying to beat inflation). That said, she has come around. I wrote up some really nice articles for her explaining some basics, like how fractional reserve works to pump property markets. Why the US housing market crashed, and what happened in the GFC. She then located 'Love of Money' a BBC documentary on the web and we watched it together. You could see all the things I had said be validated one by one. A crude awakening also helped with the energy side of the equation, though while I think she still doesn't get EROI, she certainly see US military actions as more than as advertised. I followed this up with an awesome 2 page article on the opposing forces of a naturally exponential money system that requires an exponential resource supply to fuel it and how the world environment degradation we have watched happen over our lives are the cracks in that system(pollution, wars or oil, sweatshops all now make sense) running out of resources to fuel it. On the prepping front, the combination of a natural disaster in my country that flooded the state capital brought home how even city dwellers in a temperate environment in the first world should be prudently preparing for 'whatever'(plus the understanding the supermarkets only stock a few days of food). Around this same time a computer glitch at a major national bank here locked people out of their money for nearly a week, just after Fuka occurred. At that time I had performed a preemptive bank run, just in case of a bank holiday. It all came together, not because 'the world is ending', but because preparing really was the smart thing to do. Nest egg 'savings' were increased to 40% of household income, and dry carb storage is getting close to half a ton. Providing I store it in a way that allows us to use it before it goes off, I'll keep building supplies. Overall, prepping as implemented just turned out to be good common sense. She leaves the PM's to me, but we agreed on the goals.